It was a wet and wild time at Provincials, where the snow melted into muddy off-camber bits like you see above at Riverdale Park. (That's Lorne Anderson in the leopardskin tights in the mixed Master 1/Senior 1,2,3 race, and he's passing Cycle Solutions' Stefan W. who's dealing with the most advanced class of racers he'd ever come across; "I have a plan", he told me before the start). The crowds were pretty big, the falls were plentiful, and the day was altogether successful. There were 190 racers in total, including two or three organizers from the organizing club, who paradoxically won nothing for change. The Angry Johnny's/Cycle Solutions team is the equivalent of a small town in the little world of Ontario club racing: more bodies in their colours fill the ranks of various events than anyone else. Orange and blue jerseys fill podiums continually, but somehow today was different. 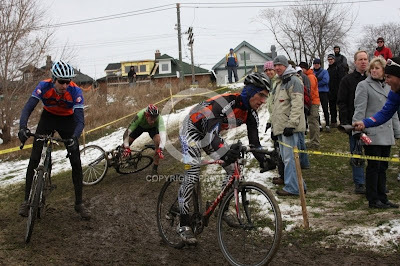 My race went reasonably well, as I navigated the course crash-free. I just didn't have any starting power/energy. It took me to the third of four long laps to get the energy flowing past the awful feeling of weak muscles. In the end I cruised to a 6th/35, forty-eight seconds off the leader. It was a day of old men: Pierre Perrin (age 51)won my event by a healthy twelve seconds or so over Brian Kelly (approx. 46 years); Had Pierre stayed in M2 where he started the season, he'd have been 15th or so. Smart guy. It was a great course though, and conditions made for a number of upsets. Peter Mogg, national M1 champion and winner of every single 2008 Southern Series M1 event he entered this year, actually lost - finishing off the podium. All in all, it was a good first season in 'cross. I had good times and a bunch of top five finishes. I love the grinta (Ital. sort of like 'guts') that 'cross is all about, and the amazing feeling you get after the agony of the race is over, and learning to think past the internal chaos outside to the race itself.